Used to determine "apparent density" of a variety of free flowing powders. 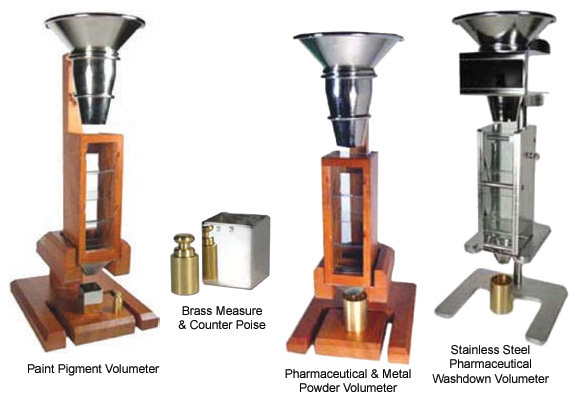 These volumeters consist of a wood base and support, a stainless steel upper funnel, glass baffles over which the powder falls into the container, a bottom stainless steel funnel and either a 25cc brass density cup or a 1" measure and counter poise. The Paint-Pigment Volumeter is used to determine apparent density of dry pigments or other free flowing, fine powders. It provides a means of reproducibly packing a tared cubic inch measure and then weighing the filled container. The upper funnel contains a 40 mesh wire screen support. Uses 1" brass cube measure (which is not certified, however, care has been taken to maintain the highest degree of manufacturing consistency as possible) and counter poise. The Pharmaceutical Volumeter is used to determine apparent density of microcrystalline cellulose. Referred to in National Formulary 18. The upper funnel contains a 10 mesh wire support. Uses a 25cc brass density cup. The Metal Powder Volumeter is used to determine apparent density of refractory metal powders and compounds. Referred to in ASTM B 329-06. The upper funnel contains a 16 mesh wire screen. Uses a 25cc brass density cup. The Stainless Steel version of the Pharmaceutical Volumeter includes a 10 mesh funnel and a certified 25cc brass density cup. It is used to determine the apparent density of microcrystalline cellulose or other pharmaceutical products and caustic free-flowing powders. The use of stainless steel for the funnels, base and baffle box, and glass plates for the baffles makes this unit the easiest to clean and maintain. Weigh the empty, dry cubic inch measure on a balance sensitive to 0.1 gram. Pour somewhat more than a cubic inch of the powder sample, dry and free from lumps, on the upper funnel and gently rub it through the screen with a non-metallic spatula. When the measure is full to overflowing, level it with a spatula to ensure that it is exactly full, being careful not to compress or shake down the material in the measure. Weigh the measure and its contents. Subtract the weight of the empty measure. The difference is the "apparent density" in terms of weight per cubic inch. 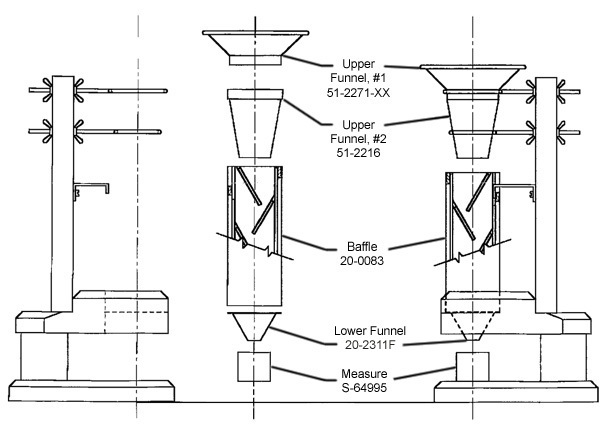 After each determination, the funnels and measure should be removed and cleaned with a soft brush and the baffle box should be tapped to free it of any adhering pigment. Other Volumeters available in stainless steel - call for pricing.